Slideshow: Monthly composite maps of sea surface salinity (hover over images to pause the slideshow). The maps below are generated from Version 3.0 (V3) of the SMAP sea surface salinity Level-3 (mapped) data. These monthly averaged data are gridded at 25 x 25 km (15.5 X 15.5 mi) resolution, with an approximate spatial resolution of 70km. They show a range of salinities from 33 to 38 using the Practical Salinity Scale (PSS; Lewis, 1980), which is roughly equivalent to parts per thousand. 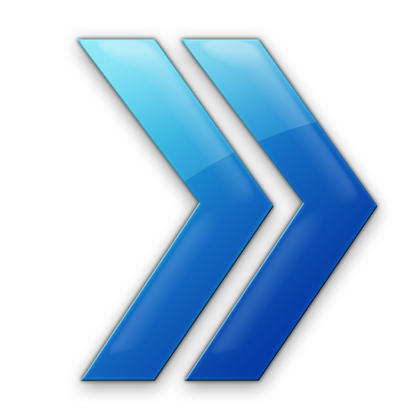 PSS and PSU (Practical Salinity Units, which is also used), are different names for the same thing. Dark blues and purples represent lower salinities while reds show areas of higher sea surface salinity. 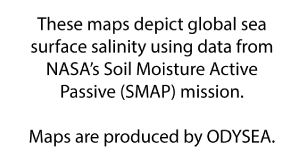 It is important to note that the color scale used for the V3 SMAP salinity maps is not the same as the one used for Aquarius Version 5.0 maps. There are plans to implement a consistent color scale between these maps. SMAP monthly sea surface salinity maps are available below in Mollweide (global), Northern Hemisphere and Southern Hemisphere projections. Click on any of the images below to see larger versions. Monthly data, along with 8-day running mean sea surface salinities, are available from PO.DAAC.